2 Only a subset of the comparative sample could be used since not all taxa examined here were included in Larson et al. (2000). Figure 3. Fossil proximal humeri from Miocene localities in Uganda. Scale bar equals 5 mm. 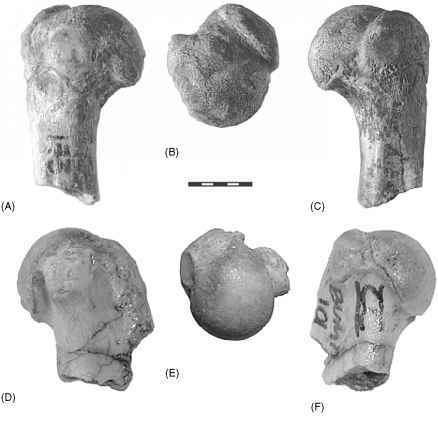 Upper row: MUZM 173 from Moroto 1 locality, (A) medial view, (B) superior view, and (C) lateral view. Lower row: BUMP 101 from Napak CC locality. 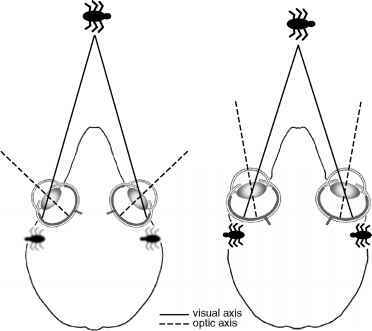 (D) medial view, (E) superior view, and (F) lateral view. mal humeral epiphysis, relative humeral head size, relative greater tubercle width, bitubercle angle, and anterior projection of the greater tubercle. ^Humeral protraction angles were available for only 22 out of the 52 species examined here ^Greater tubercle height was not correlated with body size humeral epiphyses, less long and narrow supraspinatus insertion facets, and shorter and more narrow greater tubercles. However, these latter features did not distinguish primates from either rodents or marsupials. 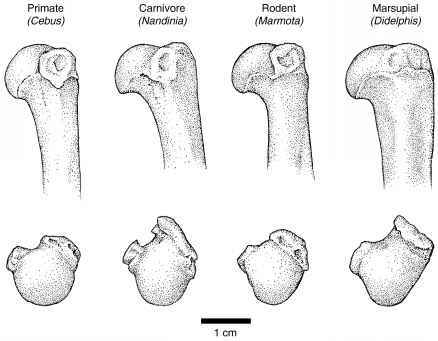 Additional features distinguishing primates from marsupials were humeral head shape and intertubercular groove width, and from rodents was angle of the supraspinatus insertion facet. Figure 4 presents drawings of representative humeri illustrating some of these differences. Figure 4. Lateral and superior views of representative humeri from the different mammalian groups examined here. Scale bar represents 1 cm. Primate humeri are characterized by a head that sits more on top of the humeral shaft than those of the other groups. correlated with this axis are shape of the proximal humeral epiphysis, bitu-bercle angle, anterior projection of the greater tubercle, and relative greater tubercle width. Inclusion of the specimen of Smilodectesgracilis as a separate group places it within the primate sample between Eulemur fulvus and Otolemur crassi-caudatus. However, Smilodectes displayed a higher loading on function 3 (which accounts for an additional 8.7% of the variance) than any of the other primate species, and in this dimension was somewhat more like the Celebes or spotted cuscus (Ailurops ursinus or Spilocuscus maculatus) (Figure 6). Figure 5. Bivariate plot of functions 1 and 2 of the canonical discriminant analysis based on the six variables that were correlated to humeral protraction angles and/or distinguished primates from some or all other mammalian groups. U: Primates; A : Carnivores; o : Marsupials; d: Rodents; Smihdectes; "h Group Centroids. Figure 6. 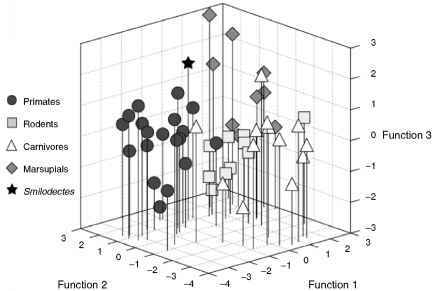 Three dimensional plot of functions 1, 2, and 3 of six variable canonical discriminant analysis. Symbols as in Figure 5. While Smilodectes falls among primates along functions 1 and 2, it is nearer to marsupials on function 3. Figure 7. Bivariate plot of functions 1 and 2 of the canonical discriminant analysis with spinoglenoid angle removed from the analysis BUMP 101; MUZM 173; other symbols as in Figure 5. More overlap between groups is evident than in six variable analysis. Smilodectes coincides with rodent group centroid, BUMP 101 falls among the carnivores, but MUZM 173 appears to be a primate. 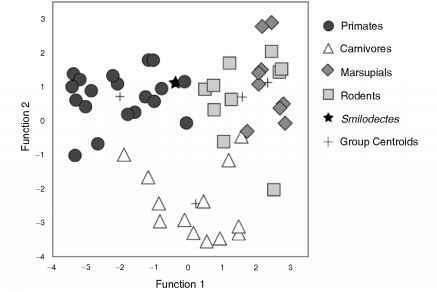 groups, and predicted group membership places Saimiri and Cebus albifrons in the rodent group, and the rodent Uromys sp. in primates. 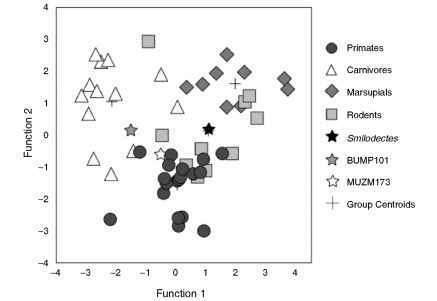 Smilodectes falls within rodents along functions 1 and 2, but is more similar to primates and marsupials on function 3 (accounting for an additional 7.3% of the variance) (Figure 8). BUMP 101 falls within the carnivore group, and MUZM 173 is just within primates, falling nearest to Lemur catta on all three discriminate functions.